HI San Francisco - Downtown i San Francisco, USA: Bestill nå! Absolutely wonderful. I was a tad anxious before going to stay for my first time at a hostel, but it exceeded all my expectations. 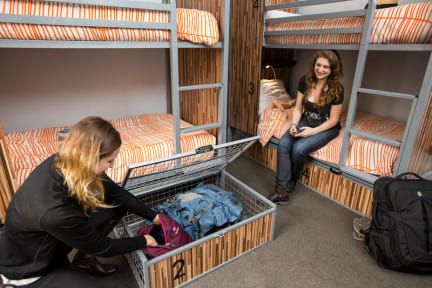 I highly reccomend this hostel to all of those whom are travelling alone or in groups. I traveled alone, but I always had someone to talk to. The standard at this hostel was really high and a huge plus is the activities they arrange. One does not get bored in the city of San Francisco if one stays here. Herlig sted med god atmosfære og utrolig hjelpsomme og hyggelig personal. Beliggenheten er topp og de tilbyr god frokost og fine aktiviteter. Anbefales!